Now this future is closer than ever! "After last week's "Bricking Out" outcry about Tesla Roadster batteries, Electric Cars developers strike back with the new lithium batteries technology breakthrough! 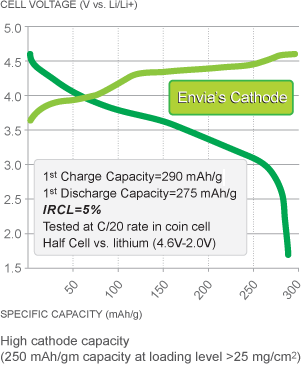 Envia Systems claims the new lithium battery technology with Energy Density of 400 Wh/kg and cost of $125 per 1 kWh. Envia Systems joins German DBM Energy, which has been lost in translation recently with its wonder Kolibri Lithium Battery and confirmsElon Musk with his call on cost of Lithium Batteries dropping below $200 per 1 kWh soon. Now, even rumors about all electric Renault Zoe 2014 with 220 miles range could be more credible. Our Lithium developers are waiting for this technology confirmation to break out from the consolidation stage now. It looks like Warren Buffet will be right on the money again with his call on Electric Cars!" German automakers are better hurry now to be in time for the electric cars to take the market by storm. GM looks like has bought a ticket into the future breakthrough Lithium Battery technology with Envia news about its wonder battery with 400 Wh/kg Energy Density and the cost dropping to $125 per kWh. Envia talks about 300 miles range for electric cars in sight now and GM is backing the company in its research. DBM Energy has been lost in translation recently - before German start up has announced ground breaking claims about the range and cost for its Kolibri Lithium Battery. Will this technology appear somewhere in the German cars now? Renault Zoe 2014 reported could have 220 miles range and this has not been confirmed by the company yet, but by all means looks feasible now. Tesla CEO Elon Musk is adding fire to the sector with his own claims about the cost of Lithium Batteries dropping below $200 per kWh in the nearest future. With Oil prices pushing Gas prices higher by the day, interest to Electric cars and Hybrids is reported to be growing now and these breakthroughs in lithium battery technology will make Electric Cars for all very soon. "After last week's "Bricking Out" outcry about Tesla Roadster batteries, Electric Cars developers strike back with the new lithium batteries technology breakthrough! 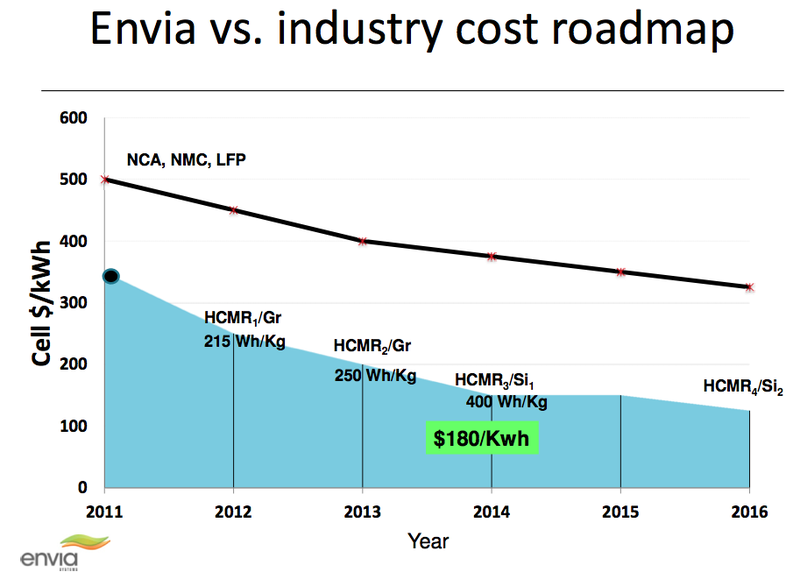 Envia Systems claims the new lithium battery technology with Energy Density of 400 Wh/kg and cost of $125 per 1 kWh. Envia Systems joins German DBM Energy, which has been lost in translation recently with its wonder Kolibri Lithium Battery and confirms Elon Musk with his call on cost of Lithium Batteries dropping below $200 per 1 kWh soon. Now, even rumors about all electric Renault Zoe 2014 with 220 miles range could be more credible. After last week's "Bricking Out" outcry about Tesla Roadster batteries, Electric Cars developers strike back with the new lithium batteries technology breakthrough! 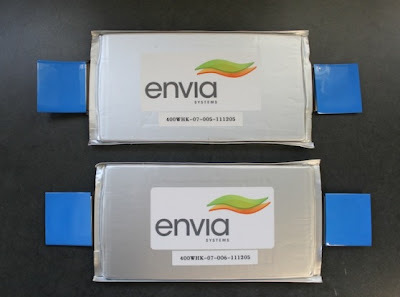 Envia Systems claims the new lithium battery technology with Energy Density of 400 Wh/kg and cost of $125 per 1 kWh. Envia Systems joins German DBM Energy, which has been lost in translation recently with its wonder Kolibri Lithium Battery and confirms Elon Musk with his call on cost of Lithium Batteries dropping below $200 per 1 kWh soon. Now, even rumors about all electric Renault Zoe 2014 with 220 miles range could be more credible. It looks like Warren Buffet will be right on the money again with his call on Electric Cars! Lithium Drive: Warren Buffett: "In not many years, you are going to see a clear change towards Electric Cars"
"Oil Empire strikes back again? Every time when we have the potential breakthrough in Lithium Batteries technology and Oil prices are driving Gas prices up - we have a "news" about polluting Electric Cars or devastating battery technology flaws. For us, all these signs are very encouraging. Who would fight so hard the Electric Cars nobody wants? We are at the tipping point now for the mass adoption of electric cars." A startup working on battery technology says it’s developed a key breakthrough that could one day lead to an electric car that has a 300-mile range and could cost around $25,000 to $30,000. Envia Systems, backed by venture capitalists, General Motors, and the Department of Energy, plans to announce on Monday at the ARPA-E conference that the company has created a lithium ion battery that has an energy density of 400 watt-hours per kilogram, which Envia CEO Atul Kapadia told me in an interview could be the tipping point for bringing electric cars to mainstream car owner. Energy density is how much energy a battery can store and provide for the car with a given battery size — the more energy dense the battery, the less volume and weight is needed. For electric cars it is particularly important to have a high energy dense battery because electric cars need to be as light weight as possible (any extra weight just drains the battery faster), and batteries that are smaller and use less materials can also be lower in cost. Kapadia tells me that current lithium ion batteries deliver an energy density of around 100 to 150 watt-hours per kilogram, while Envia’s battery can deliver 2.5 times that energy with about the same weight as the current electric cars that have hit the market. To build a 300-mile range electric car with standard lithium ion batteries, it would cost around $40,000 just for the batteries alone, says Kapadia. 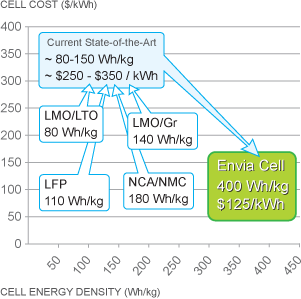 Envia says with an energy density of 400 watt-hours per kilogram, its battery cell costs could be at $125 per kWh. Tesla CEO Elon Musk has said recently that he sees battery cells dropping in price to below $200 per kWh in the coming years. Current electric cars like the Volt have been reported to be closer to $500 to $600 per kWh, and the Nissan LEAF at $375 per kWh. Envia, founded in 2007 in the Palo Alto public library, began its business by developing technology for a low-cost cathode. A battery is made up of an anode on one side and a cathode on the other, with an electrolyte in between. For a lithium ion battery, lithium ions travel from the anode to the cathode through the electrolyte, creating a chemical reaction that allows electrons to be harvested along the way. 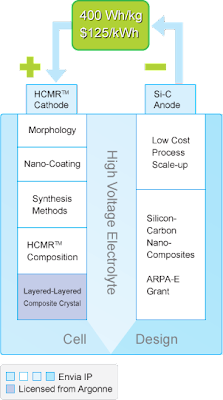 After Envia developed its cathode technology, it started working on a silicon carbon anode, and then paired these two innovations together, with a high-voltage electroloyte. Kapadia also says: “Gone are the days of relying on ancient consumer batteries for automobiles and stifling this revolution by making expensive electric cars.” And in case you didn’t get this reference, Tesla Motors uses small format standard lithium ion batteries like the ones found in laptops for its cars. 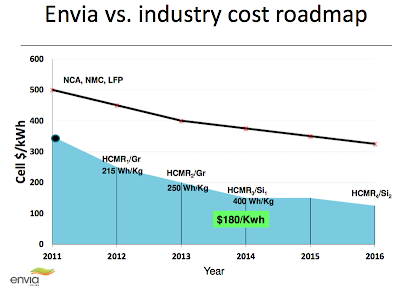 Envia is announcing at the ARPA-E conference that it has reached this 400 watt-hours per kilogram milestone in tests, but the company is still in the prototype stage, and an Envia battery will probably take about three years to move into the commercial auto market. Envia plans to work with battery and auto partners, potentially licensing or creating joint ventures to get the batteries manufactured. Kapadia tells me that Envia plans to avoid the capital intensive model of trying to be a startup that does all its own manufacturing. General Motors is one of Envia’s high profile investors, and invested $7 million into Enviaabout a year ago. GM has said that Envia will provide battery technology for future generations of GM’s Volt electric car. Other investors in Envia include Japanese giant Asahi Kasei, Pangaea Ventures, and Redpoint Ventures. Envia received a $4 million grant from the DOE’s ARPA-E program to attempt to hit the 400 watt-hour per kilogram milestone. Expect Envia to be touted throughout the ARPA-E event, as proof that its program is working to develop green innovation in the U.S. Images courtesy of Envia Systems." NEWARK, Calif., Feb 27, 2012 (BUSINESS WIRE) -- Envia Systems, a technology leader in high-performance, low-cost lithium-ion energy storage solutions today announced test results that verify the company's next-generation rechargeable battery has achieved the highest recorded energy density of 400 Watt-hours/kilogram (Wh/kg) for a rechargeable lithium-ion cell. When commercialized, this 400 Wh/kg battery is expected to slash the price of a 300-mile range electric vehicle by cutting the cost of the battery pack by more than 50 percent. 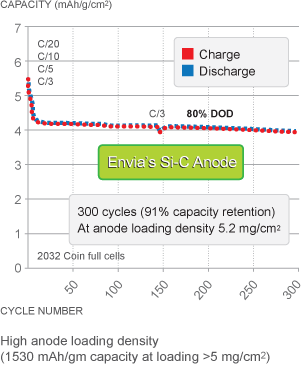 "Since the inception of Envia, our product team has worked tirelessly and logged over 25 million test channel hours to optimally develop each of the active components of the battery: Envia's proprietary Si-C anode, HCMR cathode and EHV electrolyte," said Dr. Sujeet Kumar, Envia Systems co-founder, president & CTO. "Rather than just a proof-of-concept of energy density, I am pleased that our team was successful in actually delivering 400 Wh/kg automotive grade 45 Ah lithium-ion rechargeable cells." "Envia's new battery technology represents exactly the kind of innovation and breakthroughs that ARPA-E is looking for from the American research and development community," said ARPA-E Director Arun Majumdar. "We hope that this low cost and high density battery technology enables wide spread adoption of electric vehicles across the country and around the world." 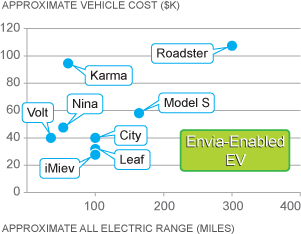 "In an industry where energy density tends to increase five percent a year, our achievement of more than doubling state-of-art energy density and lowering cost by half is a giant step towards realizing Envia's mission of mass market affordability of a 300-mile electric vehicle," said Envia Systems Chairman and CEO Atul Kapadia. Envia Systems is the industry leader in high performance, low cost lithium-ion energy storage solutions. Based in Newark, Calif., Envia's patented cathode, anode and electrolyte materials enables its batteries to deliver high energy density, safety and calendar life. These systems are used by manufacturers developing Electric Vehicles and Plug-in Hybrid Electric Vehicles. For more information, please visit www.enviasystems.com . Envia was awarded grants by both the Advanced Research Projects Agency-Energy (ARPA-E) and the California Energy Commission in 2010 to develop high energy density batteries for electric vehicles. General Motors Ventures LLC participated in an equity investment round of $17 million in 2011. For more information, please visit www.enviasystems.com . Europe is moving fast in Electric Cars space - Gas prices are already over $8 dollars per gallon there! Better place and Renault ZE roll out this year will be the new driver for electric cars adoption rate. Exploration results from International Lithium are making its way in the industry and into the analyst reports. James West from famous Midas Letter likes the company now and mentioned it in the recent "The Energy Report"
"JW: I think lithium is going to be of growing interest and would like to mention a couple of companies close to production. Lithium One Inc. (LI:TSX.V) is headed by Paul Matysek, who created Uranium One Inc. (UUU:TSX), a multibillion-dollar company. Its board of directors includes Sal de Vida and, as a major offtake partner, the Korean consortium. It has a salar deposit project in northwest Argentina that is in prefeasibility. Its other project is a pegmatite deposit in Ontario's James Bay. 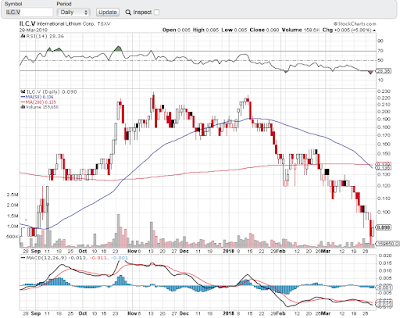 I also like International Lithium (ILC:TSX.V), which just started trading last year. It has the same sort of profile. Its pegmatite deposits in Ireland and Canada are very advanced and very rich. It also has a 160 square kilometer salar brine deposit in Argentina that looks very rich. TER: Is International Lithium's Argentine project close to any others, making it a takeover target? JW: Yes, there are a bunch of lithium companies operating in the northern Argentina zone, south of Bolivia, but I am not as familiar with them. I'll stick with Lithium One and International Lithium, the two that I think really have a shot. TER: James, thank you for your time and your thoughts." "Recent discovery of 78m pegmatite intersection in hole MF11-12 reveals multi-rare metal mineralization; 1,924 ppm Rb2O over the entire 78 metres in conjunction with 1.86% Li2O over 26.25m and 1.22% Li2O over 28.45m"
"International Lithium reports very impressive Rare Metals interceptions from its Mavis Lake project. Lithium grades are the best in Canada in drill season 2011 and now Rubidium and Tantalum will add to the potential economic viability of this very interesting project in Ontario. Stock is sitting at the year's low now and all these results should be the catalyst for the next move from this consolidation stage." "International Lithium came out with another very promising set of exploration results - this time it is geological results from its major project: Lithium and Potash Salar brine in Argentina. Now the chemistry analysis will be the most important in order to put this project on the map of the potential sources of Lithium for the Next Big Thing - Electric Cars." "International Lithium is moving very fast this year and has pulled one more set of the very impressive exploration results - this time it is high-grade Lithium boulder discovery from Ireland." 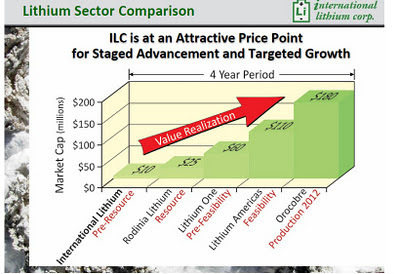 "We have a very impressive results from International Lithium Corp. today. Mavis Lake drill program has delivered the best Lithium intersections with high LI grades in Canada for the 2011 season at least! Project is growing into very promising discovery and other REM are to be reported later. Now we can see what Ganfeng Lithium was looking for during their 9 months DD on this company. Drills are primed now for Mariana Lithium and Potash project in Argentina and we hope it is only the beginning of the good news for this promising company. Company is very tightly held with 10% stake by Ganfeng Lithium and insiders hold more than 50% of the company. Insiders were only buying from the moment of spin out this company last May." International Lithium Corp. ("ILC") a "Clean Tech" lithium resource developer with a global portfolio of lithium assets. It is 29% owned by TNR Gold Corp (TNR:TSX). International Lithium Corp. ("ILC") currently holds highly prospective projects in the most prolific areas of the world for lithium and rare metals. ILC has recently secured a strategic investor, Jiangxi Ganfeng Lithium Co Ltd, from China, with focus on advancing the core ILC projects. James West, publisher of the Midas Letter, asks himself three questions when considering energy investment opportunities: Who is the management? What is the asset mix? Where is the project located? He shares the names of companies in the oil, gas, uranium and lithium sectors that have all the right answers in this exclusive interview with The Energy Report. COMPANIES MENTIONED: AROWAY ENERGY INC. - ATHABASCA URANIUM INC. - BIRCHCLIFF ENERGY LTD. - BNK PETROLEUM INC. - CRESCENT POINT ENERGY CORP. - ENCANA CORPORATION - INTERNATIONAL LITHIUM - LITHIUM ONE INC. -NEW ZEALAND ENERGY CORP. - PAINTED PONY PETROLEUM LTD. - PROGRESS ENERGY - PROPHECY COAL CORP. - PROPHECY PLATINUM CORP. -ROYAL DUTCH SHELL PLC - TALISMAN ENERGY INC. The Energy Report: James, what percentage of theMidas Letter model portfolio consists of energy-related plays? James West: Energy holdings represent 15% and I expect that to grow closer to about 20–25%. TER: Starting with oil and gas, which fundamentals are pushing you to invest? JW: I have to qualify that oil and gas no longer track each other in prices. In fact, they are so widely divergent as to be almost opposing markets. Gas in North America is much cheaper than gas in the Ukraine. In the Ukraine, you are looking at $10/trillion cubic feet (Tcf) at the wellhead; in Canada and the U.S. it is below $2/Tcf. Oil and gas companies are valued on a premium depending on how much oil and condensates they produce relative to gas. In domestic Canadian plays, I look for a much higher oil:gas ratio, in excess of 70%. If the ratio is reversed, I am not interested. However, for TSX-listed companies in Poland, Germany or France, the oil:gas ratio is not important. Large quantities of both are excellent, especially if the companies are producing light, sweet crude and low-sulfur gas. That is the best-case scenario. Once I've evaluated a company's asset base, I look at the people behind the project. I look at capitalization and management's fundraising abilities because a lot of oil and gas plays are very expensive. If the company will be an operator, does management have operating experience? Next, I look at location. 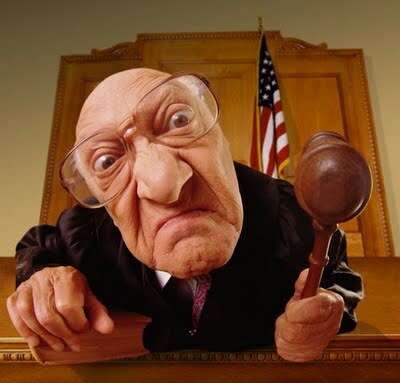 Is the project in a politically tricky jurisdiction? The Niger Delta is somewhat of a hotspot now. Kurdistan is a bit problematic; Uzbekistan, Afghanistan—the -stans are always problematic. The elections in June make Mongolia a question mark right now. TER: Recently, Canada's National Post reported that oil majors like Royal Dutch Shell Plc (RDS.A:NYSE; RDS.B:NYSE) and Malaysia's Petronas Nasional Bsd are evaluating plans to build terminals in the Kitimat, British Columbia area to export liquefied natural gas (LNG) to Asia. The Postspeculates that the need for more natural gas could lead to a rash of takeovers with names likeTalisman Energy Inc. (TLM:TSX), Painted Pony Petroleum Ltd. (PPY.A:TSX.V), Progress Energy (PGN:NYSE) and even Encana Corporation (ECA:TSX; ECA:NYSE). What are your thoughts on that speculation? JW: The oil majors are considering LNG terminals for export to Asia because they get a better price in Asia, where there is a big and growing market. A lot of fundamental market drivers support that idea. Companies like Talisman, Progress and EnCana are looking down the road. Building an LNG terminal can take up to 10 years from baseline environmental studies to the time you turn on the tap and start loading ships. This talk and activity is about capturing opportunities to move gas from its source to where it is needed, and in anticipation of the time when the global inventory diminishes. Today, fracking and horizontal drilling have created new opportunities and new reserves of oil and especially gas. Now, you can drive a drill bit anywhere you want. Trillions of cubic feet of gas are in the global inventory. The market—always irrational—overreacted to that and now gas is at an all-time low. That will not last. There is increased resistance to hydraulic fracking because blasting a toxic concoction of chemicals and fluids deep into the ground undermines the competency of the rock structures, and causes both the chemicals and natural gas to contaminate aquifers that supply drinking water. That is not just radical environmentalism; it is a real concern. For example, New York has banned fracking because of the problems with drinking water in Pennsylvania and in other places. But the environmental concerns are up against equally strong economic concerns. With the economic weakness, the collective mindset is against environmental interference that delays economic activity derived from hydrocarbon exploration in the form of hydraulic fracking. TER: What investment-worthy themes do you see playing out in the energy space this year? JW: I think uranium prices will recover. I am not a fan of nuclear power, but as an investor, you cannot ignore the price movements of commodities and the inherent opportunities. Very knowledgeable people tell me there is demand for uranium in anticipation of a nuclear power construction boom in China. I think lithium prices will increase and we are already seeing higher graphite prices. Oil prices will continue to rise incrementally, with gas prices remaining stable or even tipping a bit going into summer in the Western Hemisphere. The Eastern Hemisphere is a different story. It will retain its higher gas pricing premium, roughly five times that of the Western Hemisphere. There are a couple of caveats regarding incremental price increases for oil. If Iran, the second-largest OPEC producer, experiences a military regime change, the price of oil could spike to $140/barrel (bbl). The rise in sectarian Muslim violence in the Niger Delta, the largest African producer of oil, has already caused disruption, including a pipeline explosion. JW: Coal is like natural gas. I always ask: Where is it? What kind is it? Who are you going to sell it to? The best coal story in terms of near-term share price appreciation is Prophecy Coal Corp. (PCY:TSX; PRPCF:OTCQX; 1P2:FSE). It has 1.4 billion tons at its Chandgana Ulaan Ovoo project. It has two coal mines in Mongolia. One is immediately south of the capital, Ulan Bator, where Prophecy has a permit to build a 600-megawatt power plant that will consume more than 2 million tons (Mt) of its coal annually. Called the Mine-Mouth Power Plant, it will be built right at the mine, and should be operational by 2016. The company is negotiating the power offtake agreement. According to its preliminary economic assessment (PEA), it has a good internal rate of return, but the exact numbers depend on what the power purchase agreement number is. It looks like it might be $0.06/kilowatt hour (KWh). The financing will be 70% through debt, 30% equity. Now, 70% debt is not what you'd call a done deal, but all of the Chinese and Mongolian players are ready to write checks. TER: Prophecy is already producing coal. Will all of its coal go to the Mine-Mouth plant, or will it still export some? JW: That is the beautiful thing about Prophecy, it has flexibility. It has an immediate project that will consume 2 Mt/day. It has a great offtake partner in itself. Essentially, it will sell the coal as electricity. It also has tons left over for export. It has exported some coal from its mine in Northern Mongolia to Russia, and that will likely increase in the future. The company also owns 42% of Prophecy Platinum Corp. (NKL:TSX.V; PNIKD:OTCPK; P94P:FSE). Prophecy Platinum is a very liquid stock, last trading at more than $4. Basically, Prophecy Coal's entire market-cap value is in Prophecy Platinum shares. It is as if the power plant and the coal operation are a bonus for investors. There is a discount because Mongolia is perceived as a bit flaky when it comes to deciding what to do with its natural resources. The Mongolian election in June adds some uncertainty. But the bottom line is that Mongolia is growing and it needs electric power. No matter who is elected, this plant will get built. The government will not steal it from Prophecy Coal because the government does not know how to run it and it lacks access to capital. China, its next-door neighbor, will make sure everything happens according to plan. TER: Are there any gas-heavy names you believe deserve attention? JW: Let's look specifically at names that might benefit from construction of LNG terminals in Canada. Although LNG terminals only process large suppliers of gas, even small suppliers can benefit indirectly. The majors are going to be looking for juniors like Aroway Energy Inc. (ARW:TSX.V; ARWJF:OTCQX), which has an inventory of production and exploration targets in the form of lots of good three-dimensional (3D) seismic data. Besides drilling nine new wells this year, Aroway is shooting 3D seismic over 75% of its 101 sections on its 29K hectares. It is building itself into an attractive takeover target. Shell Canada Ltd. is just to the south of Aroway. Birchcliff Energy Ltd. (BIR:TSX) is immediately to the west, and it has Crescent Point Energy Corp. (CPG:TSX) on its northeastern border. Aroway is essentially surrounded by billion-dollar plot companies, all of which will be looking to supply those LNG plants. TER: Where and how is Aroway drilling? JW: It is drilling in a very prolific region, into the Peace River Arch in the Leduc Formation. It's a traditional well with vertical and horizontal wells. TER: In its first year, Aroway's share price went from $0.20 in July to the mid-$0.80s now. Can the company follow that with another successful year? JW: I believe its second year will be even better for a couple of reasons. First, its joint venture partner controls the distribution and gathering infrastructure for the oil and gas on its land. Second, the company did a private placement at the end of 2010, which put some selling pressure on its stock. That pressure is gone; the company is cash-flow positive and no longer needs to raise money. At this point, there is no downward pressure on the share price from previous financing. In 2011, Aroway said it would exit with 600 barrels per day (bbl/d). In fact, it exited with 670 bbl/d. Aroway under-promised and over-delivered. That is a key driver to getting a better share price valuation. But it remains under the 1,000 bbl/d mark. A company is not even considered a junior producer of any substance until it produces over 1,000 bbl/d. This year, Aroway's targeted exit production is 1,200 bbl/d. That will put the company into a new category and more companies will be looking at it as a takeover target and as a good, largely derisked investment, one with long-life wells and a clear growth strategy for a land package that could support average production of at least 100 bbl/d per well. Its neighbor Birchcliff Energy is a billion-dollar company, producing 17,000 barrels of oil equivalent per day (boe/d). The possibility for Aroway to do that only grows with time. At the current price, it is still a fraction of what I think it will be worth. And remember, that 670 bpd reported production and its 1,200 bpd target for 2012, is only 50% of the oil being produced from those wells. Aroway's joint venture partner accounts for the remaining 50%. So, in essence, Aroway exited 2011 with more than 1,200 bpd on its own balance sheet. There will be a lot of compelling reasons for Aroway and its joint venture partner to merge. At that point, it becomes a very attractive takeover candidate for a large mining company. I think 2012 will be even better than 2010 and 2011. TER: Do you have another gas name? JW: BNK Petroleum Inc. (BKX:TSX) is one of my favorites. The first thing that attracted me to BNK Petroleum is its people. Ford Nicholson, the chairman, was a board member of Bankers Petroleum Ltd. (BNK:TSX) and InterOil Corp. (IOC:NYSE). He also was with Tartan Energy Inc. (TEW:TSX.V). Bob Cross is another marquee name in oil and gas investment, former chairman of Yorkton Securities and of Northern Orion Resources Inc. (NNO:TSX) and non-executive chairman of B2Gold Corp. (BTO:TSX; BGLPF:OTCQX) and co-founder and chairman of Petrodorado Energy Ltd. (PDQ:TSX.V). General Wesley Clark is also on the board. 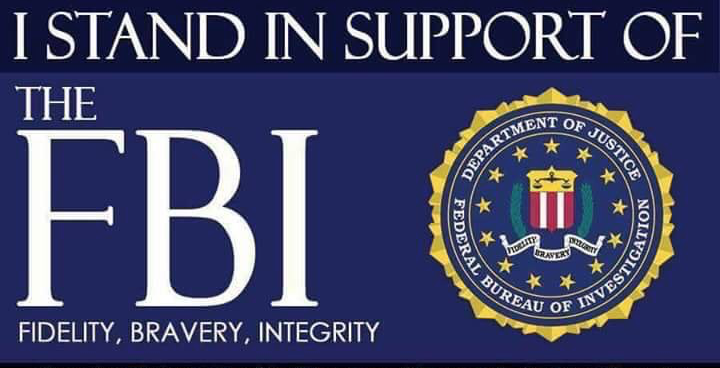 The caliber of people involved is quite impressive. The company is the largest landholder in Europe in terms of shale gas formations. Its share price has fallen, which is an opportunity for risk-tolerant and opportunistic investors. It is trading at $1.70 and has a total market cap of $250 million. In Europe, it is largely in Spain and Poland—two countries that need the bounty afforded by rich gas deposits. It also has very large land holdings in Texas and in Oklahoma in the Tishomingo field. Considering the size of its land position and the scarcity of gas in Europe, the company is in the right places. It is in production: just under 40 Mboe, 24% of it oil and 40% is natural gas liquids. There is a real premium for that. I recommended it at $2.20. Then it lost $1.70 on the negativity associated with its lack of success on its first wells in Poland. This was an overreaction by the market. I think the company will rebound. TER: What are some liquids-rich plays that you have some exposure to in terms of condensates? JW: Again, BNK is a good one. New Zealand Energy Corp. (NZ:TSX.V; NZERF:OTCQX) has just started to really get up steam in the market. Here too, management is important. John Proust and his team have been working diligently. This is the first onshore drilling production in New Zealand, which has always been a large importer of oil and gas. The company is producing 550 bpd light crude from its Copper Moki-1 well in the Taranaki Basin. It will drill as many as 10 exploration wells in 2012. The company has 152,000 acres, a potential 66 MMbbl resource and 730 MMbbl oil in plays. TER: For the first time since 1978, the U.S. Nuclear Regulatory Commission has licensed construction of two new nuclear reactors, and you mentioned the Chinese nuclear construction plans earlier. Are you partial to any particular uranium plays? JW: Athabasca Uranium Inc. (UAX:TSX.V; ATURF:OTCQX) is shaping up well. It just finished its first round of drilling and we are waiting for the assays. NexGen Energy Partners LLC is another. It is a private company at this point, but will be going public. The dough is still rising. This is going to be the uranium play of the year if Athabasca Uranium is not. TER: Do you have any parting thoughts on the energy space? JW: I think lithium is going to be of growing interest and would like to mention a couple of companies close to production. Lithium One Inc. (LI:TSX.V) is headed by Paul Matysek, who created Uranium One Inc. (UUU:TSX), a multibillion-dollar company. Its board of directors includes Sal de Vida and, as a major offtake partner, the Korean consortium. It has a salar deposit project in northwest Argentina that is in prefeasibility. Its other project is a pegmatite deposit in Ontario's James Bay. TER: James, thank you for your time and your thoughts. Read James West's gold and precious metals market insights here. Midas Letter is the investment strategy journal of the Midas Letter Opportunity Fund, a Luxembourg-based Special Investment Fund that specializes in Canadian-listed emerging companies in the resource sector with a focus on precious metals explorers and miners. James West is the portfolio and investment advisor to the fund. Every month, West's Midas Letter Premium Edition deconstructs the economic and political events of the past and upcoming week, and identifies risks and opportunities to investors seeking to profit while the majority of investors are losing money. 2) The following companies mentioned in the interview are sponsors of The Energy Report or The Gold Report: Royal Dutch Shell plc, Lithium One Inc., New Zealand Energy Corp., B2Gold Corp., Aroway Energy, Inc., Athabasca Uranium Inc., Prophecy Coal Corp. and Prophecy Platinum Corp. Streetwise Reports does not accept stock in exchange for services. 3) James West: I personally and/or my family own shares of the following companies mentioned in this interview: Aroway Energy Inc., Athabasca Uranium Inc., Birchcliff Energy Ltd., BNK Petroleum Inc., Crescent Point Energy Corp., Encana Corporation, International Lithium, Lithium One Inc., New Zealand Energy Corp., Painted Pony Petroleum Ltd., Progress Energy, Prophecy Coal Corp., Prophecy Platinum Corp., Royal Dutch Shell Plc and Talisman Energy Inc. I personally and/or my family am paid by the following companies mentioned in this interview: None. I was not paid by Streetwise for this interview.